I'd like to welcome Elizabeth Arroyo to the blog today, to chat with us about building street teams. This is something I'm very interested in myself, so I'm happy to have her discuss this. Marketing a book is a challenge, but with the help of enthusiastic readers and fans, the job can be a little easier. Elizabeth has worked in the community for the bulk of her professional career. She enjoys quiet moments, action flicks, and dancing with her four-year-old. THE SECOND SIGN is her debut novel. You can find more information about Elizabeth on her website. Thanks for hosting me. I'm excited to be here. Building your "street team" on the actual street. I spent a lot of time working in the community--10 plus years. During that time I helped organize youth conferences and workshops using community networks. If you're planning a youth event, a large conference, a small writing workshop, or a book signing event in the community, the hardest part is getting the youth to show up. There are loads of competition for a young person's attention: school, friends, Facebook. Targeting youth-at-large (a young person between the age of 13 - 18 regardless of reading & artistic influence), becomes difficult but not impossible. And I urge you not to minimize the impact these youth-at-large may have in your marketing plan. Throw a wide net for the best community impact. Here are some tidbits I learned along the way to ensure a great turn-out. You don't have to plan this alone. Not only could you have the support of schools and libraries, which are the obvious targets for authors, you can engage churches, after school programs, community centers...anywhere youth and/or parents congregate. Who's going to get the youth there? Adults. Parents, teachers, youth workers, and youth mentors are your allies. It's a give and take world: Reciprocity. Try saying that ten times. When working with churches and community centers make sure you have a plan that includes giving something to the community. Oftentimes, these community entities are the targets of campaigns and marketing tactics that leave the community feeling a bit taken advantage of. Yes, you want to be able to sell your books, but you are also selling yourself. You are the brand. And you have something to contribute. There are some communities that have more resources than others, make sure you do your homework, especially if you want to get paid for your services. Don't be afraid to do a pilot run of your author activity first and include youth in the planning of it. Most youth centers have a youth leadership component. They want youth to be leaders in their community. These are the teens you should include in your planning of an event. High schools usually require students to do community service hours. This is true in Chicago, you may want to check your city. Leadership development in planning an author activity may fall in line with their service learning hours. It's free labor, use it. Utilize your local elected officials. Let them know you are planning this event. Invite them. They usually come with their own entourage of publicity that will help get your name out there. And finally, don't be discouraged by that youth who rolls their eyes at you as you're giving your best line about your book, or the youth that's tapping his feet to a beat in his head. They are listening, trust me. After one of the youth conferences I helped plan, we passed out an evaluation (which I encourage you to do) and 99% of youth reported that it was the first time they ever talked to a professional and they wanted more time to speak with them. And this event was held on a non-school day, in the morning. So they are listening. And I betcha when that young person sees your book on the bookshelves after an event, they're more likely to pick it up. Bred to believe in the war between angels and demons, Gabby has come to the conclusion that love is responsible for war, jealousy, and all the other deadly sins she can think of. So when she’s exiled to the middle of nowhere for getting kicked out of her fifth school for fighting, she doesn't expect to meet Jake. Much less fall in love. But Jake is quickly drawn to the eerie beauty of her violet eyes while Gabby is unsettled by their undeniable connection. 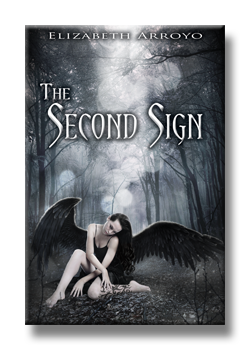 As Gabby and Jake begin to unravel the mystery behind the Second Sign, she learns Jake may be the key to saving her soul. But it means a sacrifice has to be made that will change their lives forever. That's where I have to take a leap of faith. Getting out with the community is something that both frightens and excites me. Thanks, Elizabeth, for the great advice. I was equally terrified. It helps not to do it alone. Build a team of like-minded folks, they each add to the table.